I'd like to introduce a new tool at 4for4: Schedule-Adjusted Fantasy Points Allowed. Other sites may provide fantasy points allowed by position and by team, but those reports probably don't remove schedule bias. If a defense has a tough schedule against a specific position -- say they have to face Aaron Rodgers, Michael Vick, Drew Brees and Matthew Stafford in the first four weeks -- then that defense's points allowed to QBs isn't going to look very good. But given their difficulty of schedule -- what we call "bias" -- they may not be bad against QBs at all. Conversely, a defense that doesn't allow very many points against an easy schedule may look better against the pass than they actually are. Once we reach Week 4, we can start to remove this bias with a reasonable amount of confidence since not only do we have data for the defense in question, but we also know how the QBs they faced fared against other competition. As the season wears on, the data gets better as the sample size continues to grow. Below are the first few rows of our Schedule-Adjusted Fantasy Points Allowed tool, which is sortable by position. The data is current as of Week 4. It's not a big surprise that the Jets and Ravens lead the league in fewest points allowed to QBs (especially after that offensive debacle in Week 4), but one of the best things about this tool how it reveals tough (or easy) matchups that wouldn't otherwise seem that way. Take the Jaguars, Bengals and Redskins. All three teams have been quite good given their schedule and at this point, they're not an appealing matchup for opposing QBs. Once we have adjusted points allowed, we can then look at a player's upcoming schedule. This is useful when evaluating waiver wire pickups or potential trades. Here's a look at our QB Hot Spots tool. Looking at Week 5, we see that Matt Ryan, Ryan Fitzpatrick and Cam Newton all have good matchups. Conversely, Joe Flacco's upcoming schedule doesn't look too favorable outside of a Week 8 matchup with the Cardinals and a Week 10 date with the Seahawks. What about Fitzpatrick's playoff schedule against the Dolphins and the Broncos -- pretty favorable, no? Of course, we publish Hot Spots for all positions (including PPR for RBs, WRs and TEs) so you can always stay on top of your team's upcoming matchups. 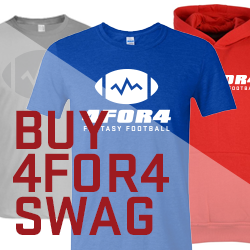 This is just one way that 4for4 helps subscribers dominate their leagues. Since we're already a quarter the way through the season, the subscription price has been discounted to $10.95. Sign up now.